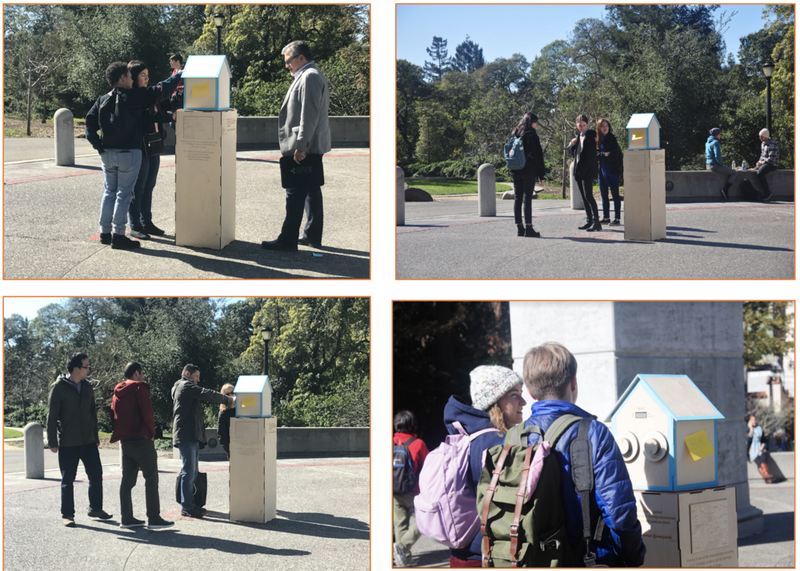 A protest exhibition intended to raise awareness and invite observation, interaction and participation regarding the issue of Berkeley housing. Our project consisted of fabricating one square foot of space into a model house with an interactive method of examining how the pricing of that square foot has changed locally and nationally across the last two decades. The house also doubled as a comment box, offering space for people to submit their housing stories and experiences to be published through social media. By presenting a context of data with a decontextualized unit of space, we hope to offer a novel perspective on how the spaces we live in are valued. By offering interaction with the data we collected, we hope to draw attention to our local living circumstances and provide a forum for expression and communication about such issues. 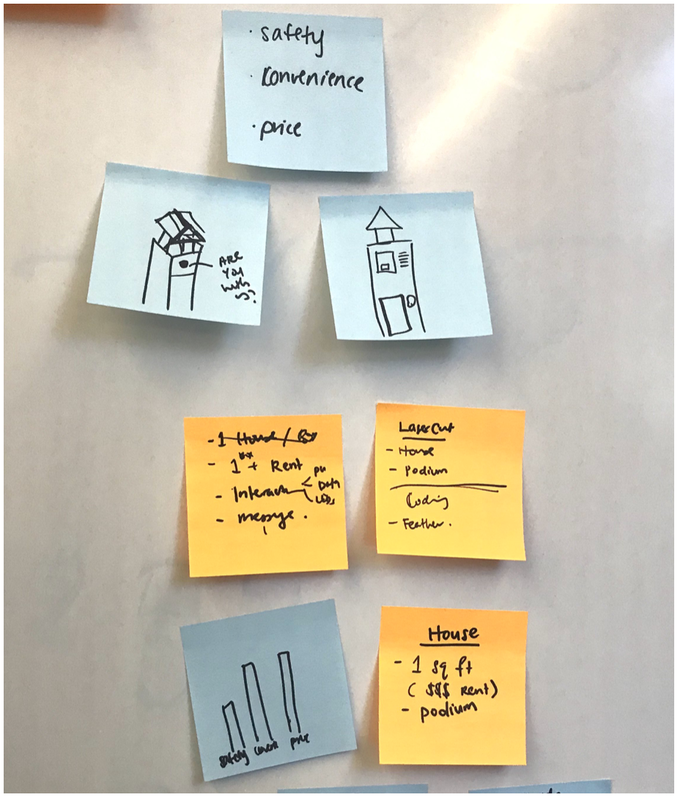 Final video for One Square Ft.
To understand the problem space, we conducted ethnographic interviews to understand needs, frustrations, and pain points around the topic of housing. After gaining some initial background understanding into the protests and movements surrounding housing issues, we conducted in-person interviews with a focused demographic to get a better understanding of the needs, frustrations, and painpoints surrounding the topic of housing. We interviewed both undergraduate and graduate students who lived in 4 sectors of housing around the Berkeley Campus - Northside, Westside, Southside, and Southwest - as well as commuters from surrounding cities. Can you tell me a bit about you current housing experience? Can you walk me through a day in your life, including accomplishing activities like commuting to class/work, doing chores, cooking, buying groceries, doing laundry, etc.? How has your execution of these day-to-day tasks changed between your current and previous housing situations? What are some positive aspects of your housing situation? What are some of your primary concerns? We then began to synthesize our user research and extract key insights into students’ motivations, pain points, and desires. We clustered main quotes and comments from our research efforts during an affinity mapping exercise, and noticed patterns and themes emerging from our investigation. We decided to collect some data that would show Berkeley’s rent market trend. Since numbers alone are hard to understand, we compared Berkeley’s data to the national average and that of two other cities famous for their high cost of living, San Francisco and New York. Because rentals vary not only in price, but also in size, we decided that a better value to compare is rent per month per square feet. To calculate this value, we found the average rent per month of all bedroom sizes in each city, using the same website source whenever possible. The sources we used most often were RentCafe and Zillow. Other sources include: BerkeleySide, SF Rent Board, the New York Times, the US Census, and the Department of Numbers. In calculating the average rent per month per square feet, we assumed that the average square feet for rentals in each city hasn’t changed much over the past years, so we went with the most current values. To account for inflation, we used areppim AG to convert the average rent prices to real US dollars. From our personal experiences and interviews with our friends, we came to see a recurring pattern in the problems that most students have with housing in Berkeley; the cost of rent was the largest issue, but other common ones included safety, convenience, and space. Therefore, we decided we wanted our project to focus on these issue and invite the public to participate in the protest or interact with the data themselves. We decided to focus on Berkeley, comparing relative cost between time periods (2000, 2010, 2015, present) and locations (Berkeley, SF, NYC, National Average). We explored with how to best present the data we collected on Berkeley’s rent such as by year, neighborhoods, distance from campus, and by square foot. In the end, we determined that presenting the rent per square foot would be the best way to compare prices not only between years but also between cities in a way that would allow the numbers to take on greater meaning. This led us to play around with how to incorporate this concept of “square foot” in our design. 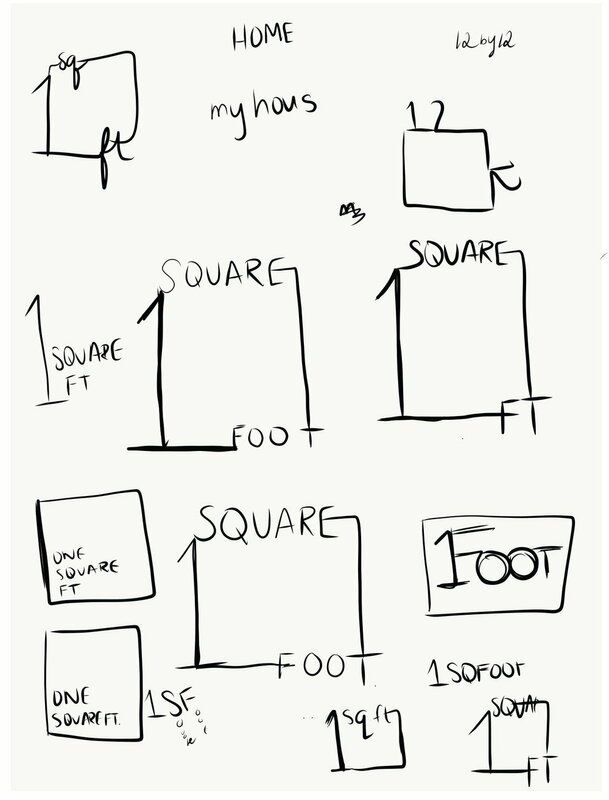 To best visualize and compare the cost of housing, we came up with the concept of “1 Square Ft”. In addition, we decided to tape a one square foot box on the ground in front of the podium so that people can experience the size themselves. We also created a one-foot ruler around the base of the house to make it more clear that the house is exactly one square foot. To tie our entire project together, we returned to our main concept of one square foot to create our logo, eventually settling on the simple, easily reproducible design. We intended to make a podium to raise our One Square Ft house close to eye-level for easy interaction. For this purpose we used the laser-cut box generator at http://www.makercase.com/ to generate the design for a finger-tabbed wooden podium. We then used the design files with a laser cutter with a 24 x 48” bed to cut and engrave the walls of the podium and house, including decorative and informational elements. After all the pieces are cut, we assembled the base and walls of the podium and secured the pieces using wood glue, save for the top. We then assembled and glued the walls and roof the house, save for the front panel. 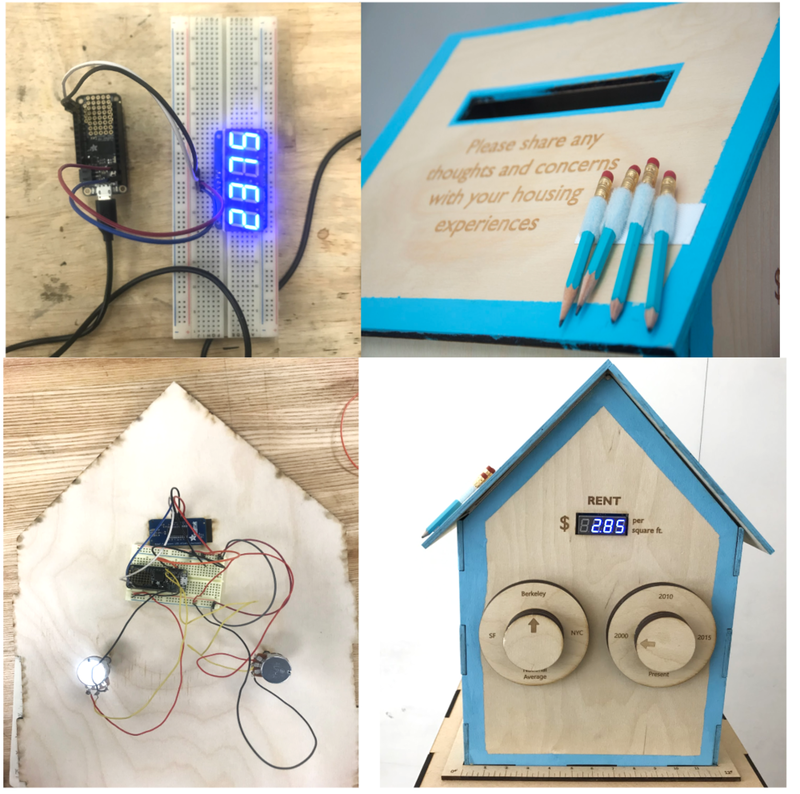 For the interaction component which allows someone to compare a 1 square ft rent across different locations and year, we used a microcontroller (a Feather for this example), a breadboard, 2 potentiometers and a 7-segment LED display. We first set up the electronics by soldering the backpack onto the 7-segment display. We then laser cut and engraved wooden circles which would be used for the two dials - location and year - with the smaller circle as a knob and the larger circle as the base. Due to the continuous motion of the potentiometer, we used magnets between the knob and the base to represent a discrete set of choices. The final concept: a house on podium, at eye level, with 2 dials to represent time and location. To encourage public participation, we added sticky notes so anyone can share their housing concerns. We also created a twitter account to share these concerns.